Unique Packaging Systems a pioneer in the Packaging Industry develops machines as per customer satisfaction. Our experienced engineers are always dedicated in providing the best masterpiece in the industry. 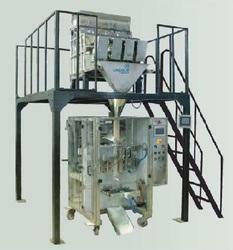 We offer Dry Fruit Packing Machine such as Almonds Packing Machine and Cashew Packing Machine from India. Reel Core Diameter 70mm to 76mm. Max. Weight 50 kg. 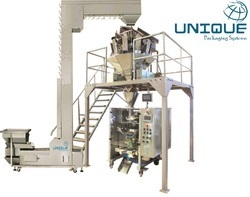 UNIQUE PACKAGING SYSTEMS offer Multihead Weighing Packing Machine for Almonds, Cashews, Kurkure and Potato Chips, Chiwda, Namkeen, Dry-Fruits, Grains. Highly suitable for Kurkure and Potato Chips, Chiwda, Namkeen, Dry-Fruits, Grains, Tea, Sugar, Seeds etc. Filling Capacity (Range) 5Gms - 1Kg / 500Gms - 2Kg / 1Kg - 5Kg / 5Kg - 10Kg. Application :- Highly Suitable for Cashew Nuts, Almonds, Kurkure, Chiwda, Namkeen, Dry-Fruits, Grains, Tea, Sugar, Seeds etc.